Joyci Milagros is an incredible young woman. Her friends, Bianca and Sarai are in the same league - along with a few other women in Iquitos, Peru. They walk around with hearts as large as the Pacific Ocean. The three angels operate under the umbrella: Iquitos Libre De Crueldad Animal (ILCA). They don't have much, but the little they do have goes to save dog after dog from their dejected life on the street. Ojitos is one of them. This is his story. On a steamy jungle morning Joyci was on her way to work. 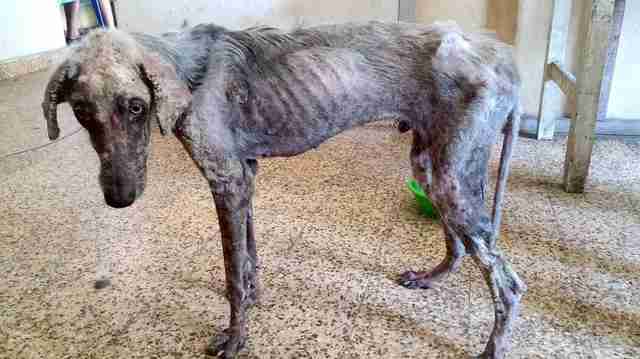 She spotted a very sick dog, skin and bones, scavenging through the wet garbage with only a few strands of hair covering his back. 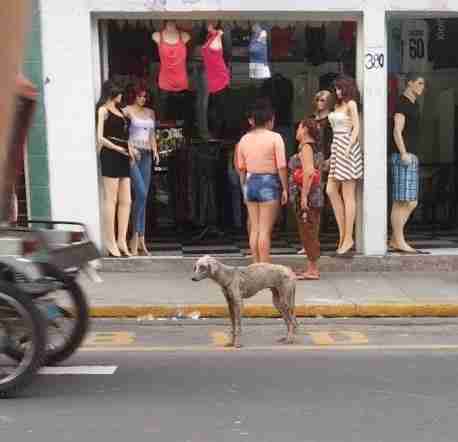 This isn't an unusual sight in Iquitos or in most places in South America where strays roam around in large numbers, in conditions that is beyond comprehension. 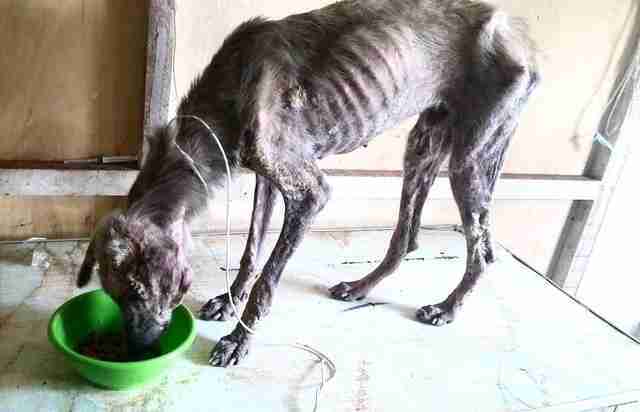 Joyci felt an immediate obligation to help the poor canine, but before she could do anything, the dog was gone. She returned the next day hoping to find the canine in need, but no luck. 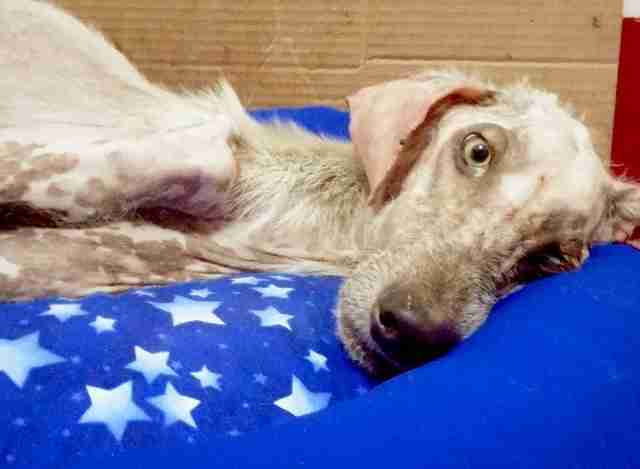 She was about to give up when - from a distance - she noticed another dog in dire need of care. 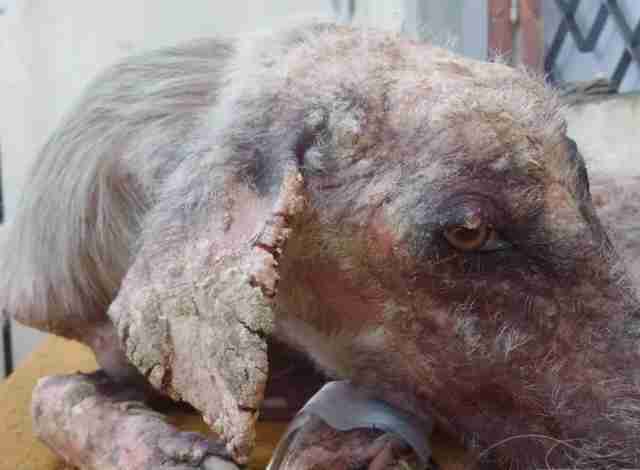 Covered in mange and bacterial infections, malnourished and on the verge of death the dog stood in traffic as if wanting to deliberately end his own life. He felt like he didn't matter to all those who walked by him day after day turning a blind eye. But he did matter to Joyci. The dog's eyes penetrated deep into his soul, one could see years of indifference and suffering at the hand of the very human that domesticated him. Right there, on a steamy morning Joyci promised the dog that she will never let him be in that state...ever again. She named him Ojitos, for he only had eyes, big eyes...his body so thin, almost invisible. On September 12 Bianca, Joyci's friend offered to take Ojitos off the street and give him shelter. The Director of Amazon Cares - a local non-profit rescue organization- offered free treatment for Ojitos. That was the easy part. The hard part was bearing the eyes of all the people who stared at the women in utter disgust, every day , for three months. No one could understand why the women would touch a 'dog like that'. Even the tenant next door moved out because he couldn't stomach the sight of a 'sick' alien of dog. But the women were unshakeable. They saw through the mange, they saw through the hardened skin. 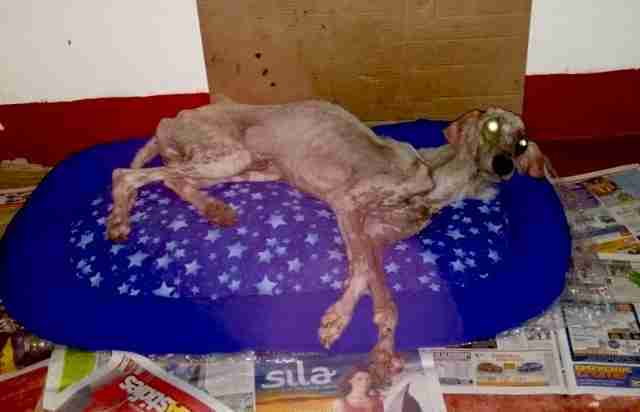 They saw a beautiful being underneath all the neglect. 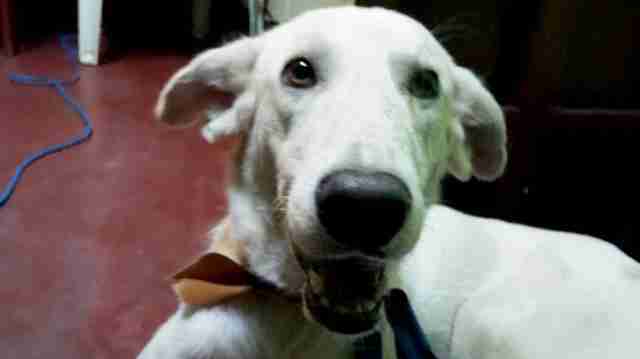 After moths of daily treatment Ojitos finally emerged from his shelter as a playful, stunning, eager dog. His enthusiasm for life is inspiring many around him. He is a few months away from completing his treatment and the team is already taking applications for his adoption. Sometimes it takes a village to raise a child. It also takes -if not a village but- the compassion of many likeminded individuals to save and give a life. The coordinated efforts of the wonderful women of Iquitos gave Ojitos another chance to love, to serve, to smile, to frolic, to gallop and to inspire. Many thanks to Sarai for her support, to Tanith Pena Araujo at Amazon Cares, to Dr. Cindy for the healing food, to Vinka for Ojitos' first bed, to Veronica, to Mrs. Maria Elena, to Yuriko, to Dr. Esther and to the entire team at AMAZON CARES. 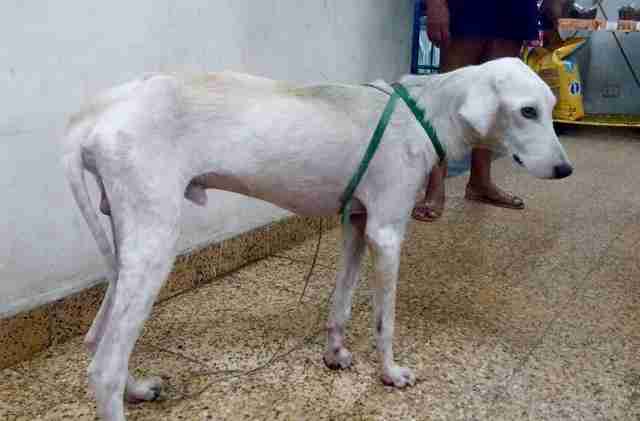 If you would like to help more dogs like Ojitos, please visit amazoncares.org and make sure to add OJITOS as a note so we can allocate the funds accordingly. Thank you!